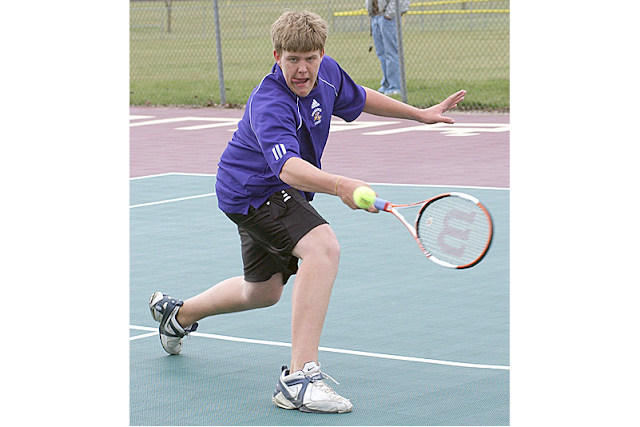 He was once just your typical rebound-grabbing, tape-measure home-run-mashing, serve-and-volleying, trombone-playing 270-pound high school quarterback. Then Brandon Scherff kept growing until he was the NFL draft's best—and nastiest—offensive line prospect. IOWA CITY, Iowa — Randy Gregory hadn’t spent much time lined up on the right side of the defensive line that day. The matchup was better on the opposite side. Really, the matchup anywhere in the college football world was better than across from Brandon Scherff on a Saturday afternoon. But in the second quarter of this game between Big Ten foes Iowa and Nebraska in November 2013, Gregory, the Huskers’ stud pass rusher, tried his chances against Scherff, Iowa’s left tackle. Future first-round draft pick vs. future first-round draft pick. If you want to know why Brandon Scherff is widely considered the best offensive lineman in this year’s draft class, this play is a good starting point. It was third-and-19, an obvious passing down. Gregory lined up far to the outside, the wide-nine technique, and Scherff engaged him in pass protection. But when the play broke down, and Hawkeyes quarterback Jake Rudock scrambled to his left, something unusual happened. Scherff shifted his momentum forward, converting in a split second from protector to aggressor. By the time he was done plowing Gregory out of the way, the two were across the field at the opposite hash marks. Point, Scherff. Consider this analogy from Iowa offensive line coach Brian Ferentz: Imagine your car is stalled on the top of a hill and begins to roll back down. You’re trying to stop it. Then suddenly, not only are you stopping it from rolling down the hill, you’re pushing it back up the hill for five seconds. That’s what Scherff did on that play. Scherff is the favorite to be the first offensive lineman taken in this spring’s draft. Hear enough about his legendary feats from across the Hawkeye state, and it’s easy to understand why. 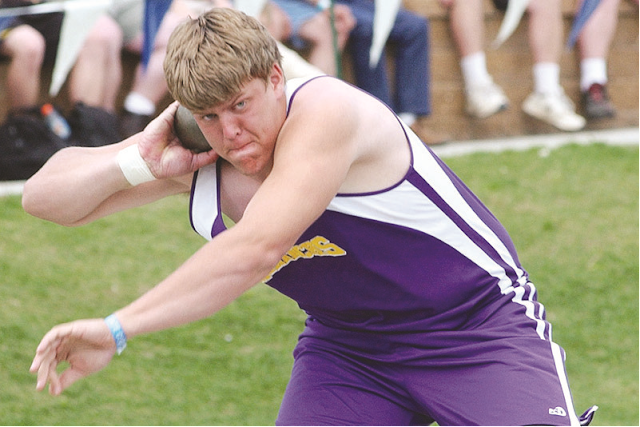 The first time anyone from the University of Iowa laid eyes on Brandon Scherff was in 2008, at the Iowa high school state track and field championships. 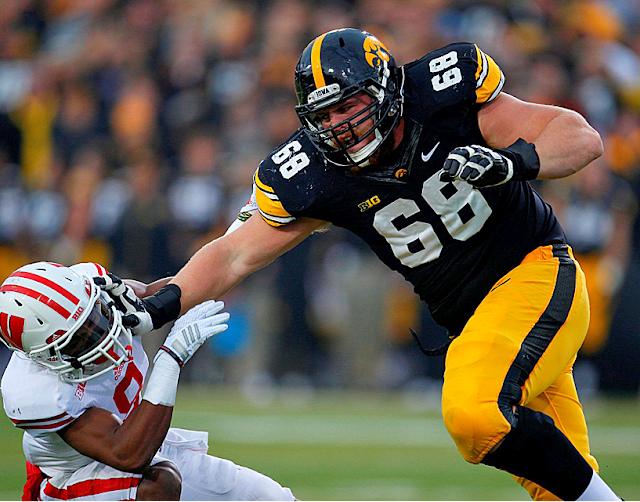 Scherff was a sophomore shot-putter, dueling against another Iowa football recruit. Those are the attributes that have helped more Iowa offensive linemen get drafted into the NFL than those from any other school over the past decade (13 since 2003)—a fact that is printed on Brian Ferentz’s business card. Of course, when Iowa was recruiting Scherff he wasn’t a lineman. He was Denison High’s 270-pound quarterback. His favorite play was the quarterback sneak, which he’d call on his own pretty much any time the Monarchs had second-and-5 or less, and especially when he spotted an even defensive front. He’d motion to his center to go left and he’d go right, or vice versa, and then Scherff would surge through the opening for the first down. Scherff’s center, by the way, was 170 pounds soaking wet. Growing up in Denison, a farm community of about 8,000 where the major industry is now beef and pork meat-packing plants, Scherff literally stood a head above his classmates. His athletic skills were just as obvious as his size. In little league, he hit a home run so far that it pinged off a nearby water tower. He was the rare youth soccer player adept at using both his left and right foot. As a fifth-grader, he won a regional to earn a trip to the NFL’s punt, pass and kick competition at the Metrodome. He won, and then got to watch his quarterback idol, Daunte Culpepper, start for the Vikings. As a high school freshman he competed in five sports—football, basketball, track and field, tennis and baseball—and also played trombone in the school band. Scherff spent some winter breaks working at a Christmas tree farm, lugging trees out to customers. One of his high school coaches started calling him Paul Bunyan. The nickname was perfect considering Scherff’s local folklore. He could lob a shot put 65 feet by his senior year, the farthest distance ever on the western side of the state. During a game at Creighton University he blasted a home run over dead center, a distance of 405 feet, past the fence and onto the adjacent road. “It’s probably still rolling down toward the Ameritrade ballpark down there,” says Don Lyons, his high school baseball coach. He racked up as many as 20 rebounds in a single basketball game, and he finished his high school career with a school-record 613; second place on Denison’s career list is 474. “He reminded me of Moses Malone,” says Lyons, who also coached him in basketball. But football was Scherff’s future, specifically the offensive line. Iowa coaches broke the news to him during a recruiting visit, and Scherff understood. He had literally outgrown the quarterback position. Halfway through his junior year, Denison coach Dave Wiebers called him into his office on a Monday and told him they were switching him to tight end. Scherff put his hand in the dirt for the first time during a practice that afternoon, started at tight end on Friday and caught a touchdown pass on the opening drive. Iowa’s genesis as O-line U. began when Kirk Ferentz arrived as the school’s position coach in 1981 and developed three first-round draft picks in the 1980s. After a brief stop in Maine and six seasons in the NFL, Ferentz returned to the Hawkeyes in 1999 as a head coach. In two stints covering 25 seasons in Iowa City, he can’t remember many freshmen coming into the program weighing more than 300 pounds. Scherff was one of them. The coaching staff’s challenge was clear: mold Scherff into the program’s next great offensive lineman. Scherff hadn’t lifted until his junior year of high school and had eaten everything in front of him in anticipation of being a Big Ten offensive lineman. Chris Doyle, Iowa’s strength and conditioning coach, put him on a strict eating schedule that shaved off eight percentage points of body fat and harnessed Scherff’s brute strength. Last summer, a video of Scherff hang-cleaning 443 pounds three times (a school record) went viral. “It was a very typical day of training,” Doyle says matter-of-factly. 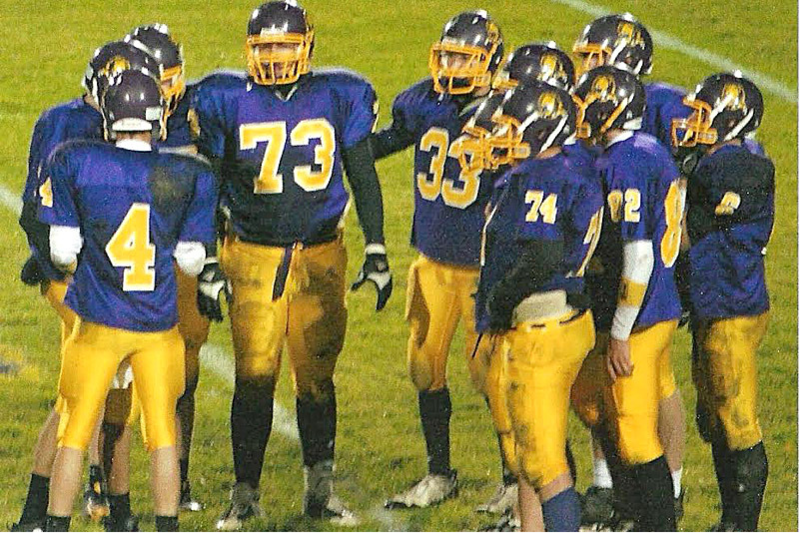 As a sophomore, Scherff shared time at left guard with Matt Tobin, now with the Philadelphia Eagles. When Riley Reiff entered the draft after his junior year, Scherff stepped in at left tackle. Iowa’s last three blindside protectors: Scherff, Reiff, Bryan Bulaga. There’s a tradition among Iowa offensive linemen. Every Saturday morning during the spring, starting at 6:30, they do skill work. It’s a routine Scherff has kept up with as he prepares for the NFL draft. 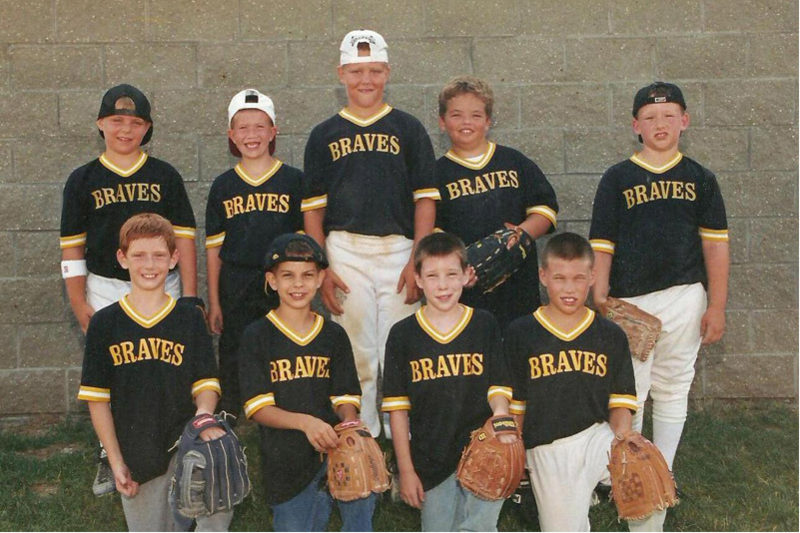 This is where the athletic versatility that comes from playing five sports comes in handy. Scherff’s agile feet were developed on the tennis court, his power honed by heaving a shot put, and his competitive drive heightened by years of battling for rebounds. And while it’s irrelevant to his NFL projection, Iowa coaches are only half-joking when they say Scherff might have been the team’s best punt returner. Sure-handed. Unusual hand-eye coordination for a big fella. True to form for an offensive lineman, Scherff isn’t a big talker. That’s something he learned from his parents: Bob Scherff, the transportation director for the Denison school district, and wife Cindy, an elementary school teacher. But a switch flips for Scherff when he starts watching football highlights. There are plenty from his career at Iowa. In another clip from that same 2013 game against Nebraska, he sprinted 30 yards downfield to try to clear a path to the end zone on a sweep play. One of his favorites is a play against Pitt. A blitzer thinks he has a free path to the quarterback until Scherff stuffs him like a bully slamming his victim into a locker, then drops him. There’s one clip in which he drives an Ohio State defensive back all the way to the sidelines, heeding Brian Ferentz’s instructions to finish the block until the refs pull their flag, but before they throw it. Later in his highlight reel, he takes another Buckeyes defender and flips him to the turf. The morning of the football banquet that followed Scherff’s junior year, Kirk and Brian Ferentz sat down with him and his parents. Kirk Ferentz told Scherff he was in a rare position where he had the game won: He could leave early for the NFL draft and would probably be selected in the same vicinity that Bulaga and Reiff were (each went 23rd overall, to the Packers and Lions, respectively). Or, he could return for his senior season, and the NFL would be waiting for him a year later. As a senior he won the Outland Trophy, given to college football’s best interior lineman, and he also added another chapter to his legend—the time he tore his meniscus, and only missed one practice. 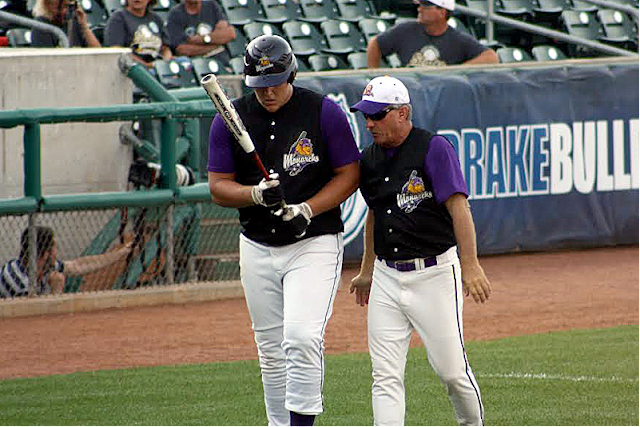 The injury happened in the first half of a September game against Ball State. He came back after halftime and finished the game, then found out Monday night he had a small tear in the meniscus of his right knee. Tuesday morning, he had a knee scope. Scherff knew if he took pain medicine the doctors would have to hold him out, so he refused it. Wednesday morning, he lifted. Thursday, he practiced with the team. And on Saturday, he started against Iowa State. Kirk Ferentz has never coached a player who was back on the field that quickly after a knee scope, much less one who was also just months away from being a first-round draft pick. The vetting process for expected first-round picks is thorough. One NFL team’s director of security recently paid a visit to Denison. 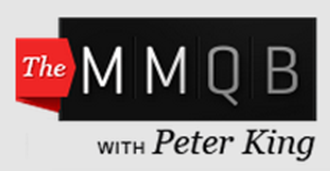 He sat in Wiebers’ office for about 45 minutes, recording the conversation. Wiebers had gotten about a half-dozen questionnaires in the mail from NFL teams in December and January, but this was his first in-person visit. They went through a list of questions: Do you know his brother and sisters? 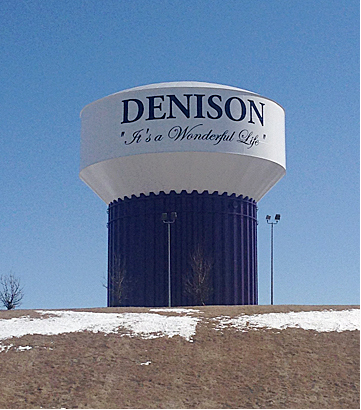 (Brandon is the third of four, and his older brother played center for Denison). What are his hobbies? (Hunting and fishing). When was the last time you talked to him? (A few days ago). That’s pretty much who Scherff is—a small-town Midwestern kid who happens to be blessed with rare athleticism. In high school, after Friday night football games he’d fish with teammates at one of the farm ponds. He hunts coyotes (he bagged 11 in one trip), deer (his prize was a seven-point buck)—whatever is in season. Last Wednesday night, to step outside the pre-draft pressure cooker, he and a buddy drove a truck onto a frozen pond just outside Iowa City. They set up a portable ice shanty, drilled through 13 inches of ice and went fishing for bluegill and bass and crappie. If the fish are big enough, he’ll clean them and eat them for dinner. Scherff has been the big fish at Iowa, but NFL talent evaluators are confident he’ll succeed in the big pond of the NFL, too. One night at the combine, an offensive coach whose team picks in the 20s spotted a TV replay of Scherff running the 40-yard dash earlier in the day, and lamented that he’d be long gone by the time his team is on the clock. The only real question surrounding Scherff: Where will he play in the pros? His height, 6-foot-5, is average, and his arm length, 33 3⁄8 inches, is on the short side—at least according to the lofty criteria for NFL left tackles. That’s why some talent evaluators say Scherff is best-suited to play guard. Notre Dame’s Zack Martin made a similar move from collegiate left tackle to the inside of the Cowboys’ line last season, and earned All-Pro honors as a rookie. During his 23 formal interviews with teams at the combine, Scherff sensed some coaches and GMs were trying to persuade him, saying, “We feel you can play guard.” Scherff’s answer to them was the same to as it was in high school: I’ll play wherever you need me to play. The Giants, for instance—an offensive line-needy team picking in the top 10, by the way—drafted Syracuse lineman Justin Pugh two years ago, and GM Jerry Reese said he watched tape after tape, and found no reason Pugh’s 32-inch arms should restrict him to the interior. Kirk Ferentz, who has seen NFL talent evaluation from both sides, shrugs at the debate. “Every player has holes,” he says. “Other than Ogden.” Ferentz’s mentor, the late offensive line coaching legend Joe Moore, had a saying: Good blockers are good blockers because they wanted to be, not because they were born that way. This shouldn’t come as a surprise, but Scherff has played every position on the offensive line except center, in either practice or a game. As one NFL scout wrote in his report, Scherff may be better-suited for guard at the NFL level… but he has the athleticism to play whatever. That’s a decision for the NFL team that drafts him. 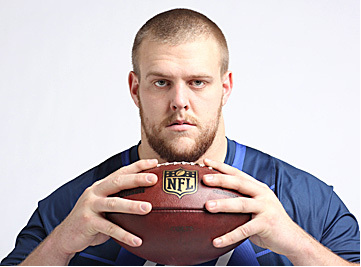 Right now, the biggest decision Scherff has to make is where to be on draft day. He’s leaning toward accepting the NFL’s invitation to attend the draft in Chicago. But about 100 friends and family bought tickets to the Outland Trophy presentation in Omaha in January, and part of him thinks it only seems right to spend draft night in Denison. After all, that’s where the legend began.